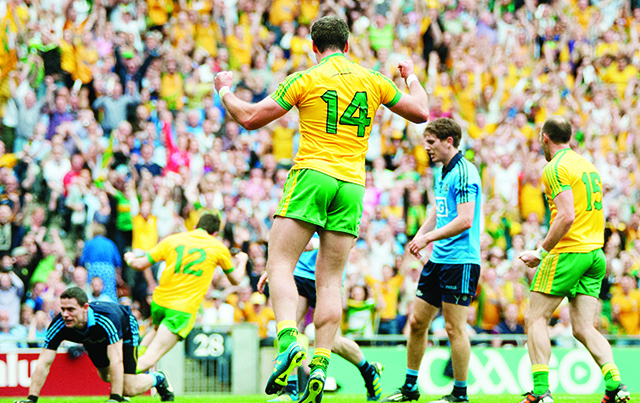 Donegal taught Dublin a footballing lesson in Sunday’s All-Ireland semi final. As Jim McGuinness remarked afterwards, every major field game requires a combination of both attack and defence. In 2011, Donegal learned that defence alone is not enough to win the day. On Sunday, Dublin found that all out attack doesn’t guarantee victory either. Damian Dowds takes a look at some of the key elements that under-pinned Sunday’s stunning victory at Croke Park. While Donegal put tremendous effort into disrupting Stephen Cluxton’s kickouts, Dublin still won possession from 19 of his 22 kickouts (86%). By contrast Donegal won possession from 16 of 31 kickouts taken by Paul Durcan (52%). Donegal worked hard to deny Cluxton easy kickouts, and at one stage midway through the first half he raised his fists in frustration at the difficulty he had in picking out an unmarked man. Cluxton is a cool customer, but this outburst spoke volumes for the difficulty Donegal were causing. That said, 9 of Cluxton’s 22 restarts went short and to a player in blue. 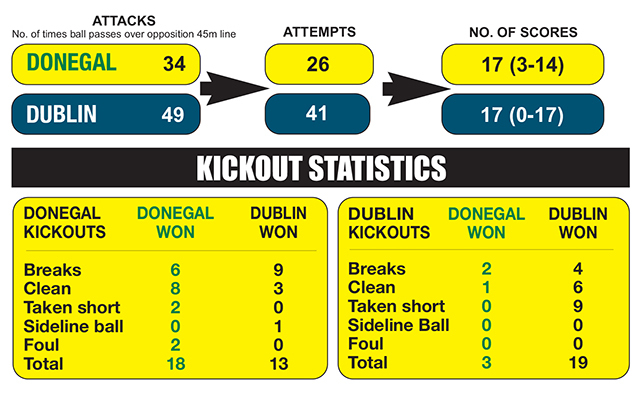 Of the 13 contested kickouts, Dublin won 6 cleanly and 4 breaks; Donegal won just 2 breaks (Toye and MacNiallais) and 1 clean (McLoone). But the bare statistic of Dublin winning possession from 86% of their own kickouts doesn’t tell the whole story. Ferocious pressure was applied to the recipient and as soon as he won the ball he usually had a Donegal man breathing down his neck. Donegal won about half of Paul Durcan’s kickouts, but as ever it is how that is converted into scoring chances rather than the simple fact of winning them that is key. And therein lay one of the key components of Jim McGuinness’ gameplan – target your opponent’s greatest strengths. Dublin’s philosophy under Jim Gavin has been all out attack, with their half back line bombing forward at every opportunity. It served them well: Dublin have won the last 2 Leinster Championships, 2 NFL titles and last year’s All-Ireland. But all out attack leaves gaping spaces in defence and Donegal sought to accentuate that by having our half forward line drop back inside our own half in the certain knowledge that their markers – Jack McCaffrey, Johnny Cooper and James McCarthy – would follow them. Ryan McHugh’s 28th minute point came after Big Neil Gallagher had won a Durcan kickout. McFadden pointed in the 40th minute after Gallagher had won a break, same again for the St Michael’s man’s 46th minute goal. Patrick McBrearty’s 2 points came after Gallagher and McHugh had won breaks. All these scores came within moments Donegal winning possession from Durcan’s booming kickouts down the centre that allowed McGuinness’ team to exploit the acres of space Dublin had left behind them. In contrast to what the Dublin attack faced at the other end, Donegal’s shots had a low intensity training session feel to them. And that was just on the kickouts. Time and again Donegal counterattacked in numbers, creating overlaps and hitting 3 wonderful goals and a bagful of points. Somehow, Dublin continually failed to pick up Ryan McHugh’s late runs into the parallelogram and his 2-2 from play could easily have been 3-1. And Donegal could have had more goals. Ryan McHugh, Colm McFadden, Frank McGlynn and Patrick McBrearty all had opportunities to go for goal had there been a need to. Dublin’s defensive naivety was breathtaking. The Metropolitan’s previous manager Pat Gilroy had initially adopted an all out attacking philosophy until Kerry hammered Dublin by 1-24 to 1-9 in the 2009 All-Ireland quarter final. Gilroy described his players as being like ‘startled earwigs’, but he learned the lesson and Dublin became considerably less gung-ho and more defensively minded for the remainder of his term. Dublin under Jim Gavin forgot that lesson, and forgot that to win a team needs to be able to defend as well as attack. Dublin’s strength in depth had been touted beforehand as their trump card, with Donegal said to have a thin looking and ageing squad. Dublin substitutes had scored 2-23 in the championship before Sunday, and just how were Donegal going to handle that, pundits wondered. Scoring 2-23 from the bench in 4 games was indeed impressive, but as we pointed out in these pages last week, many of those scores came against teams that had already been beaten out the gate. With Dublin chasing the game, their subs – with the exception of Paddy Andrews who scored 2 points – struggled badly. Kevin McManamon, Dublin’s talismanic impact sub, hit 2 wides and had another goal attempt blocked in the square by the peerless Michael Murphy. Dean Rock didn’t manage a shot on goal at all. Neither did Devereux, Daly nor Mannion. By contrast, the springing of Christy Toye from the bench before half time irreversibly changed the flow of the game. Toye ran for all he was worth, cutting through and finding space inside the porous Dublin defence. He only managed a single shot on goal, which dropped short, but his direct running – which has been a feature of his game throughout his career – was ideally suited to Donegal’s counterattacking gameplan. Likewise, Patrick McBrearty’s pace killed Dublin when he was introduced on 43 minutes. He hit two wonderful points and set up a couple of others with James McCarthy and others trailing in his wake. He has been used to telling effect as a big-time impact sub now in both the Ulster final and the All-Ireland semi final and perhaps it’s a role we’ll see him filling in a fortnight’s time too. If hitting Dublin on the counterattack was one part of Donegal’s gameplan, defending so as to keep goals out was equally important. 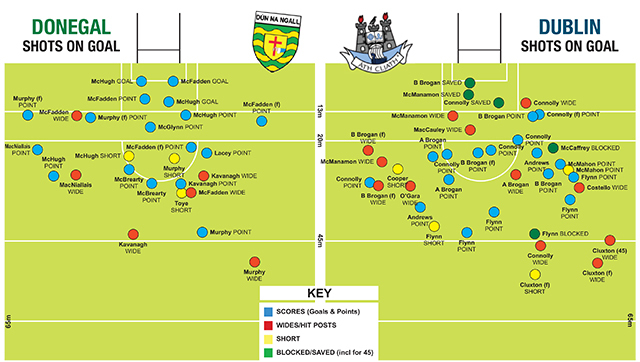 Donegal’s back 6 set out to mark the Dublin forwards man-for-man, with others coming back to pressure the man in possession and block up the running channels the Dubs had used to such devastating effect in chalking up 9-88 in four previous championship games. Dublin did get through for 2 chances in the first half, with Neil McGee doing enough to put off Bernard Brogan for the first, and Durcan saving with his legs from Diarmuid Connolly on the second. Those were Dublin’s only goal attempts until a couple of late, half-chances from Kevin McManamon when the game was long lost. Dublin hit 10 points from play in the first half, mostly from long range with Paul Flynn and Diarmuid Connolly in top form early on. But the law of diminishing returns set in, and those long range efforts started going astray when bodies tired and Donegal took command. 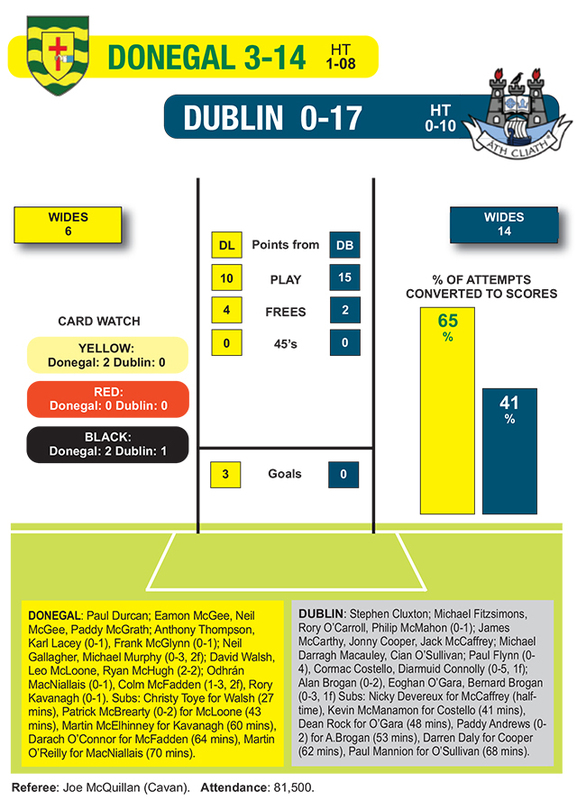 As you can see on the page opposite, 12 of Dublin’s 17 points came from outside the D. In fact, only a quarter of all their efforts including their misses came from inside the D.
Dublin had been psychologically broken. 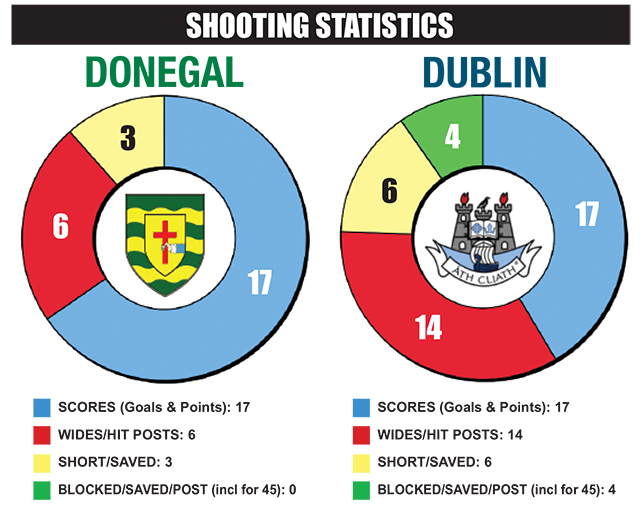 Their shooting grew as erratic as it had been in the first half of the infamous 2011 semi final with Bernard Brogan missing easy frees, Alan Brogan shooting wildly, even Diarmuid Connolly – who was by some distance Dublin’s best performer – screwed attempts badly wide while under severe pressure. Donegal’s discipline was such that they conceded just five scoreable frees in the game. Thankfully, both Cluxton and Bernard Brogan had off days from the placed ball. Donegal, by contrast, scored at will from much closer range. Other than Murphy’s long-range point in the first half, the remaining 3-13 came from within 35 yards of the posts. Donegal converted 4/5 from placed balls. Dublin managed just 2/6. For Donegal, it was the most perfect performance ever witnessed, marrying the defence and counter-attacking style that has been at the heart of the Jim McGuinness project. The sheer skill and concentration of the players, and the honesty of their effort is something to behold. As is their grace and humility in victory. Their focus is already on Kerry, the most decorated team in Gaelic football history. The final won’t be anything like the semi final, but Donegal have the Man With The Plan, the players to deliver on it, and look forward to 21 September with confidence.